Blog Why Is Al-Jazeera Targeting The Egyptian Government? Why Is Al-Jazeera Targeting The Egyptian Government? On 30/12/2013, BBC News published an article titled ” Why is Egypt’s Government Targeting Al-Jazeera” written by Hugh Miles who worked previously as an investigate journalist for Al-Jazeera. Mr. Miles testimony in his article fits very well the brainwashed, retarded and morons audience of Al-Jazeera, but it doesn’t fit at all with the majority of Egyptians and those who know the difference between the politicized faked misleading news and news based on facts on the real ground. Hugh Miles why Al-Jazeera is targeting the Egyptian Government. I challenge Mr. Miles to bring me any piece of news broadcasted on Al-Jazeera which revealed or even criticized its own Qatarian regime?! None, not even a single one! I also Challenge Mr. Miles in proving that what Al-Jazeera is airing about Egypt is really true! Prove it based on facts, that’s Miles Job as a journalist to publish facts and not narrative stories based on big fat lies. Sheikh Hamad was not exactly ruling his small Qatarian Peninsula based on democracy. And because I’m totally the opposite to Mr. Miles fabricated testimony, and I call spade a spade. Sheikh Hamad is a dictator who practiced oppression against freedom of speech, which I will prove later in this article. I will also prove the fabricated news aired by Al-Jazeera on events in Egypt. 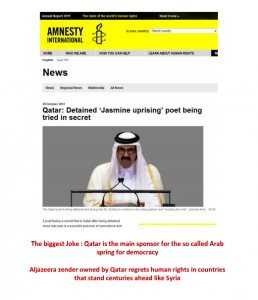 Al-Jazeera’s target since it was established is to criticize and attack all Arab countries and incite them against each others, from one side to fit Qatar’s political interests in the region which match with the US policy, and on the other hand, to distract the Qatarian people from what their own regime is practicing internally. After Mubarak stepped down on 11/2/2011, Qatar thought that it can become the new Arab country who will lead the whole region according to its own agendas and interests, and Al-Jazeera/Qatar fiercely support the Muslim Brotherhood fascist regime in Egypt since they reached power and till this minute we speak. Qatar is one of the countries involved in the espionage case of Mohamed Morsi and Muslim Brothers terrorists which first trial will start on 28/1/2014. Link to the National security report’s testimony by Mohamed Mabrouk the main eyewitness on the case and the national security Officer assassinated in November 2013. Link to the former Intelligence Chief Omar Suleiman’s testimony on Qatar’s involvement in the espionage case with Muslim Brotherhood terrorists organization. I don’t think we will hear much from Mr. Miles after the espionage case starts which is due next month, so the whole world will learn the truth based on evidences and not just claims or conspiracy’s theory. Mr. Miles seems to be in total denial status about many events happened in Egypt or maybe he is suffering from Alzheimer’s! First, Mohamed Morsi was not democratically elected as Mr. Miles hinted. Presidential elections were forged and the case is in the hands of the judicial authority right now. Link of the latest news on the case. The journalists, Mr. Miles talked about are not above the law, are they? on 31/12/2013, 5 journalists work in Al-Jazeera including an Australian, British and an Egyptian were accused after investigations of airing and publishing fabricated and false news /reports about Egypt and incited citizens on committing violence. Journalists were caught inside Mariott hotel in Zamalek airing false reports and held secret meetings with Muslim Brotherhood terrorist Organization. Investigations revealed that Al-Jazeera was paying 200 USD per day to both Australian and British elements to prepare and publish daily fabricated news inciting on violence in Egypt. Egypt is an independent country Mr. Miles and have a sovereignty on its own territory. Just remember that any foreigner lives in Egypt including foreign journalists and reporters, they either respect the laws and the rules of Egypt or get lost! The Egyptian Authorities are also independent and they know how to do their job according to the law, in protecting Egypt’s national security while fighting terrorism! Which part you did not understand, Al-Jazeera man?! Egypt is fighting terrorism and this terrorism is putting our children’s lives to daily serious threats and dangers. Does Mr. Miles think that his opinion and biased to terrorists is more important than our Children’s lives and our country’s national security? I think Mr. Hugh Miles was in a very long Coma when Muslim Brotherhood were in power, because The security status deteriorated when Muslim Brotherhood were in power, when hostility and aggression were addressed and practiced by Muslim Brothers and their supporters against women, children, Christians, Journalists, opponents and the State’s official institutions. It was deteriorating when Morsi was in power and started to kill, threatened and framed all his opponents with fake charges to shut them up! The security status deteriorated when Morsi was in power for one year and he personally was addressing hate speeches and incitement speeches against his own people. 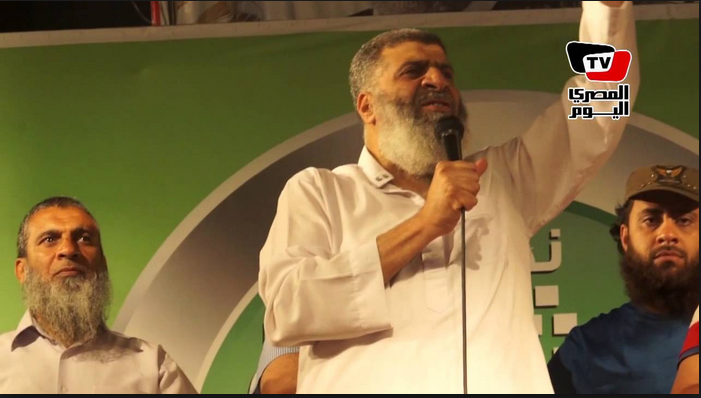 The security status deteriorated when Morsi gave a presidential pardon to more than 1000 terrorists elements and provided them with full freedom to move inside Egypt, in return of their support and protection to Muslim Brotherhood regime against all the State’s institutions and opponents. 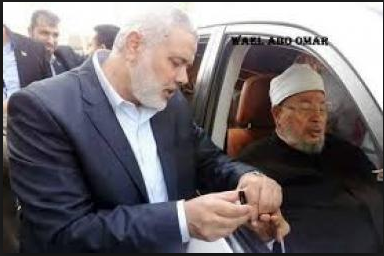 The security deteriorated When Morsi gave Egyptian identities to Hamas leaders and members and opened Egypt’s Borders for Hamas Militias to enter and exit as they pleased. It was deteriorating, When Morsi declared his dictatorship constitutional decree and gave himself powers above the law and total immunity from being questioned by any Egyptian citizen or any administrative Control authority. The Egyptian Military and the Police forces are paying daily a very precious price from their own lives and blood to protect Egyptians and Egypt’s national security while fighting terrorism, Mr. Miles. Do you know what fighting terrorism means? If Mr. Miles think that the security is deteriorating in Egypt, it is because Miles like many of foreign reporters in Egypt are biased to terrorism. And believe me Mr. Miles every Egyptian citizen who care for the security of his country, will stand against you and other foreign or local reporters who incite for violence by supporting terrorists in our country. Just Watch us! I was really going to respect Mr. Hugh Miles if he declared that he is a big fan of Muslim Brothers terrorists and he supports them, instead of fabricating lies and false news. As Mr. Miles is a big fan of MB terrorists, this is a link documented with all Muslim Brothers crimes since they reached power till this minute, enjoy it Mr. Miles, enjoy watching Egyptian citizens blood shed by Your Muslim Brothers. God! I wonder when was the last time I heard this statement of “You are either with us or against us”, “You are either with us or with terrorism”? Now I remember, it was declared by Sheikh George W Bush Junior, God bless him and his former administration. The man of the WMD, who invaded Iraq looking for his WMD and as far as I know, didn’t find even a WMD toy made in Iraq or even made in China! Yes Mr. Miles, you are right. Since we, the Egyptian People overthrew Muslim Brotherhood Fascist Regime on 3/7/2013, call it a Coup, call it whatever you like, we don’t care anymore, we declared that you are either with us or with terrorism which means you are against the will of more than 33 million Egyptian who participated in the 30/6 Revolution. What is your problem Mr. Miles?! Was it ok for the US to declare war on terrorism and announce that the world is either with them or against them, and it is forbidden on Egypt! I guess Mr. Miles have been recruited to join the barefaced double standard US long Queue! Enjoy the Queue Mr. Miles, but please do the Egyptians a favor and move your nose away from our internal affairs! Just remember one important thing Mr. Miles, Egyptians will never forget those who are terrorizing them and those who are supporting terrorists against them. The battle over the media is a key factor in the struggle for power in Egypt and almost every Arabic language channel viewed as sympathetic to the Muslim Brotherhood has long since been shut down. Most were taken off air within hours of the ousting of Mr Morsi. Only Al-Jazeera has continued to deliver the Muslim Brotherhood point of view in Arabic. It has aired round-the-clock coverage of the pro-Morsi protest movement, hard-hitting testimony from survivors of the Rabaa massacre in which hundreds of Brotherhood supporters were killed, and exclusive interviews with the handful of Islamist leaders who have managed to escape the ongoing security crackdown, such as at the start of this month with al-Gamaa al-Islamiya leader Assem Abdel-Maged. Supporters of ousted Egyptian president Mohamed Morsi shows Morsi’s portrait and posters with the four finger symbol during a demonstration against the military backed government on September 13, 2013 in the Egyptian capital, Cairo. Al-Jazeera has given a lot of coverage to the pro-Morsi demonstrations Such vigorous support for the Muslim Brotherhood has served to make the network simultaneously the leading TV outlet for the beleaguered Islamist movement and a thorn in the side of Egypt’s new government. Without Al-Jazeera, the government would otherwise enjoy dominance of the TV news spectrum, so it is easy to understand its frustration. There can be little doubt the Egyptian authorities would love to shut the channel down altogether if they could, although this is a highly unlikely eventuality given that all their attempts to achieve this in the past have failed. During the Hosni Mubarak era, the information ministry used a variety of ingenious methods to try to silence Al-Jazeera, including preventing it from using Egyptian government studios, blocking its satellite feed, detaining its correspondents and forcibly deporting its family members. Despite this, in January 2011 Al-Jazeera was viewed by many as playing a leading role in fomenting the unrest that led to the toppling of President Mubarak. Thorn in the side’s of who Mr. Miles? Yours?! I can recommend a good doctor for you, not just to remove the thorn, but to remove the thorn and the side as well! I can understand Mr. Miles serious pain caused by the thorn in his side, otherwise he wouldn’t publish a lousy article full of lies. I think the pain was more than Mr. Miles could handle which made him write nonsense and myths! Mentioning Assem Abd Elmaged (Gamaa Islamia). Do you even know who is Assem Abd Elmaged? Assem Abd El Maged was terrorizing Christians when Morsi was in power and declared publicly that he is so proud of killing 118 civilians and police individuals and officers in the 80’s and he considered that the period he killed these victims, it was a wonderful period. Assem Abd Elmaged and his militias were burning Christians homes and terrorizing them. Threatened Judges and moderate Muslims who were protesting against Mohamed Morsi. Assem escaped to Qatar and Qatar refused the Interpol’s request to deliver him to Egyptian authorities for crimes committed in the period of Morsi’s regime! These 2 following videos prove all what I mentioned here and it is from the mouth of Abd Elmaged. Assem admitted that killing Egyptian soldiers from police and military, is an honor, because it is a Jihad and a duty and killing them was for the sake of Islam, and he did not regret killing them!!! Assem Abd Elmaged was one of the Terrorists who participated in the assassination of Late President Sadat and got 15 years sentence in jail. In 1981, he was the leader of Jihad Organization and was charged of overthrowing the regime in 1981 and killed 118 citizens and policemen in upper Egypt. Assem Abd Elmaged was a big supporter of MB and Mohamed Morsi. Assem Abd Elmaged, Aboud Elzomor, Tarek Elzomor and Khaled Islambouly and the blind Sheikh Omar Abd Elrahman (detained in the US for inciting and involvement in terror attacks in the USA). All these terrorists names they are the founders of Algamaa Eleslamia. Mr. Miles you should be ashamed of your self! Not sure though a big supporter of terrorists like you have any shame!? Mr. Miles, these Arabic Channels you mentioned, they were not sympathetic to Muslim Brothers terrorists. They were publicly inciting 24 hours a day Islamist Extremist supporters and terrorists groups on killing Christians and burning their churches and marking their homes for revenge and displacing them from their own homes, they were calling Islamist and MB supporters to kill Morsi’s opponents, and all protesters who even criticize the Muslim Brothers Regime. The Arabic Media who were inciting and calling for slaughtering MB opponents, was one of the countries joints Muslim Brothers were intensively working on controlling it, whether in the public or the private sector. 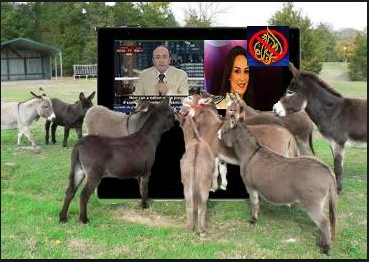 The State Media was totally controlled by Muslim Brotherhood and the Egyptian TV was only allowed to broadcast whatever match with MB interests and views. Mr. 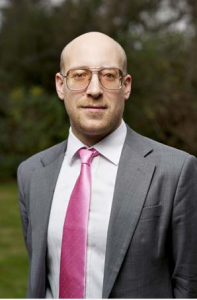 Miles, what is the main job of any news media? Is it to publish news or to incite and call for assassinations and hate speech? Do they allow this abroad in the developed countries Mr. Miles? 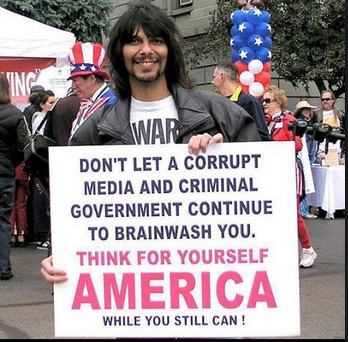 Is this your freedom of speech and press? Do they allow a journalist like yourself to go on the media and call for killing and incite for hate speeches and assassinations? Did you read the Patriotic Act of Mommy America? Did you read the Egyptian Memorandum on considering the Muslim Brothers terrorists Organization? Mr Miles, I know that you and other Journalists are using toilets just like we human beings do. In other words you and other journalists are not saints or Angels. So please know that the law applies on you and on others, when you think that being a journalist means that you are free to spread anything you want, including fabricated news and lies, especially in a country that is fighting terrorism! If this the freedom of speech and press you are defending, then why Al-Qaeda Organization and Hamas Organization are not allowed to broadcast their news from USA or Europe? Because they are terrorists? Muslim Brotherhood are terrorists too, Mr. Miles! Mohamed Morsi not even once objected on these inciting or hate speech against the whole community and especially Christians which was aired 24 hours a day terrorizing the whole community. 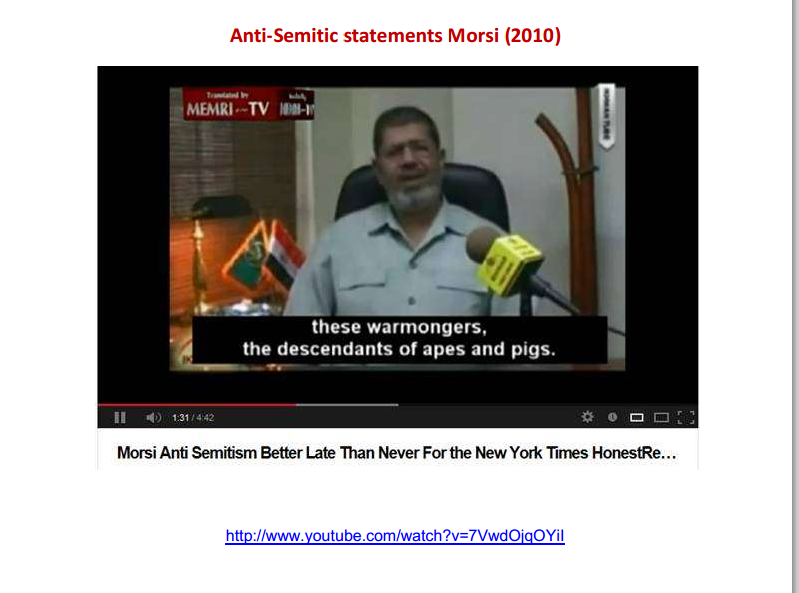 Morsi personally was inciting his supporters on hatred and killing his opponents! Be my guest Mr. Miles and translate the following videos which prove that you are nothing but a blatant liar! The following videos are what the Arabic Media were airing and broadcasting! These are just few examples and not all evidences which prove that you are a liar! Video and a report published by Alarabyia news agency- dated 15 June 2013. Many Islamist members of Al-Shura and Olamaa Al-Moslemeen Councils related to Brotherhood, announced that killing all demonstrators who will go out on the 30th of June 2013 revolution is allowed by Islam and God. They also added that according to Islam and God, all Muslims who support Mohammed Morsi and The brotherhood Regime are allowed to Kill and slaughter those who are against Brotherhood and Morsi, because they are Christians and others are related to Mubarak Old Regime. Click here to watch the video on Alarabiya news, also at the last 3 minutes of the video, Islamist clerics and supporters raised Osama Bin Laden Photos and Al-Qaeda Flag in Egypt. Video – Islamist leaders supporters of Muslim Brotherhood regime, Safwat Hegazy said in the Arabic Media that he doesn’t like how Muslims are killing their enemies and he objects that a Muslim Kills the enemies of God by slaughtering them from the neck, Good Muslims must cut the head into half! He also said, Muslims go there and kill your enemies and enemies of God. Cleric Zughby muslim Brotherhood supporter saying on Arabic Media that ISLAM is dominating Egypt, Egypt is only an Islamic country and Christians who live in Egypt must obey and accept this, otherwise they will be forced on it and they will risk losing their lives because Islam is coming and is dominating and Christians will be burned if they don’t obey! He also warned Christians for their own safety! Video – Different Islamist Clerics supporting Brotherhood were saying Muslims are not allowed to salute Christians in Egypt and if your Christian neighbor dies, you are not allowed to go and pay condolences to his families and also you are not allowed to attend his funeral and all Muslims must realize that Christians are enemies of God and enemies of Islam. They also said that Muslims are allowed to fight Christianity. Christians are originally atheist and must be killed, this is what the Arabic Media were broadcasting! So, Mr. Miles, are you publishing lies voluntarily because you are biased to terrorism or is it because you get paid to write lies in favor of terrorists? Yes Mr. Miles, all these Arabic Media terrorists were shut down and it was a popular demand just like shutting down Al-Jazeera is a popular demand as well. These terrorists Medias were putting our national security to danger. If you have any problem with this, and it really disturbs you, you can go and hit your head against the wall because your support to terrorists and complains about shutting down these medias won’t change anything whether you like it or not. Mr. Miles, Al-Jazeera was not at any time delivering Muslim Brotherhood point’s of View. Al-Jazeera was used as a tool to spread false news and incite for violence since the Brotherhood were overthrown by 30/6 revolution. Al-Jazeera was also used in the 25th of Jan to overthrow Mubarak Regime. not because Qatar was a democratic Tiny peninsula, but it was according to Qatar and other Big Allies countries interests and own agendas in the region. Rabaa square’s MB victims! are they hundreds now? not 1000, not even 2000 or 3000 like NYT, WP, FP, WSJ, CNN…etc are still claiming? Did you read or publish the autopsy report of the disengagement of MB Sit-In? As far as I know, none of the Foreign News agencies published this report. This report stated how many were injured, killed, tortured and how! It was praised by the human rights organizations, whether the local ones or the foreign ones. It’s not forged like your statements Mr. Miles! Muslim Brotherhood supporters did not escape from Rabaa Square. They were warned many times at the day of disengagement and one month earlier to the disengagement by the Egyptian Military and police forces to leave the square safely to their homes under the protection of Military and Police forces. The disengagement attended by many Human rights Organizations and reporters and it was recorded, minute by minute. No one in Egypt can forget this day 14/8/2013, when Muslim Brotherhood massacred Egyptians, police and military individuals. Link to the massacres of Muslim Brotherhood against Egyptians on 14/8/2013, documented with videos showing the quantities of ammunition and weapons found in Rabba, and showing who burned the square and who was shooting at the military and police individuals. Mr. Miles, do you accept that Al-Qaeda Terrorists camp under your home and block your way in and out from your residence and terrorize you? Do you accept Al-Qaeda to carry weapons and kidnap your kids and torture them? Do you accept that you have an armed group under your home under the cover of Protests rights?! I don’t think you do, because terrorists will never attack a big fan and supporter to their violence like your self! At least you know now that you are protected by the Terrorists you are supporting. This is a link to Al-Jazeera airing round the clock the Muslim Brotherhood protest movement and other events. Sorry Mr. Miles, the content of the link don’t match with your lies, because all the content in the link prove that you are marketing Al-Jazeera fabricated news about Egypt. Enjoy! Another link of Aljazeera broadcasting fabricated images and videos about Muslim Brotherhood and Sisterhood faked death scene and bodies waking up from death and laugh, and other funny stuff of Al-Jazeera fabricated stories, especially in using women, like this woman who converted to Islam from Christianity 2 times, while her identity stated that she was born Muslim! Other links to Muslim Brotherhood great deception and how they use the Media in spreading lies. Even when they fabricated death scene like the link here, Filmed dead bodies then the bodies were laughing and talking, they were lousy liars. 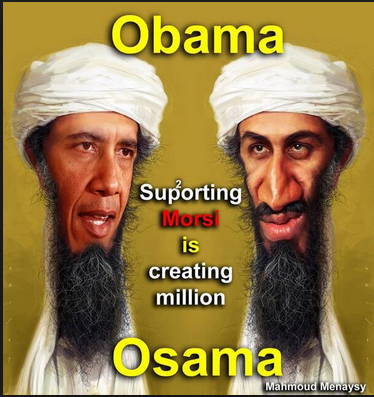 No one in Egypt is feeling any sympathy for Terrorists and deceivers Mr. Miles supporter of Terrorists. After the revolution, tensions between Egypt’s rulers and the network persisted. In 2011, an Al-Jazeera journalist was seized from a plane at Cairo airport and arrested, and the network’s Cairo offices were ransacked twice in one month after Egyptian officials blamed the network for stoking up anger against Israel and provoking a mob attack on the Israeli embassy in Cairo. None of this had much impact on the channel’s output. Al-Jazeera’s trump card is the staunch political and financial backing it continues to receive from its backers, the government of Qatar. A March 26, 2013 file photo shows Qatar”s Emir Hamad bin Khalifa al-Thani attending the opening of the Arab League summit in the Qatari capital Doha, and his son, Qatari Crown Prince Sheikh Tamim bin Hamad al-Thani smiling as he arrives in the Bahraini capital of Manama on December 24, 2012. Sheikh Hamad, left, who stepped down as Emir of Qatar in favour of his son, took a leading role in the discourse around political Islam. Although the Qatari royal family is more pragmatic and less ideological than the Muslim Brotherhood, the two share a good deal of ground intellectually and have a well-established relationship. Both of them could be described as Islamists, and both make clear they are above all else devout Muslims who seek guidance from early Islamic sources. 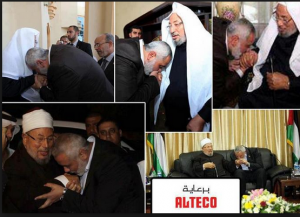 Several of Al-Jazeera’s key figures, such as Sheikh Yusuf al Qaradawi, the religious thinker and presenter of one of Al-Jazeera’s most popular shows, are long standing members of the Muslim Brotherhood. The former Emir of Qatar, Sheikh Hamad bin Khalifa al-Thani, who stepped down earlier this year in favour of his son, Sheikh Tamim, took a major role in leading the intellectual discourse in the region, especially in terms of political Islam. As the Brotherhood rose to power in Egypt, he saw an opportunity to exercise influence on Islamist activists congenial to his own religious beliefs – although even under President Morsi this support was not uncontroversial, as tensions occasionally flared over who should be the rightful leader of the Arab Islamist movement. With the removal of the Morsi government, Qatari efforts to control and influence political Islam in Egypt were abruptly curtailed. But despite that, and despite these recent arrests, in an increasingly divided Arab world, the Al-Jazeera network remains the standard bearer for the Islamist position and an aggravation for the Egyptian government. Mohamed Morsi addressed his hate speeches in many occasions, against Christians, Jews and anyone who was not a Muslim Brothers supporter. Mr. Miles you support terrorists! El Qaradawy the God Father of the Muslim brothers International organization was praising Hitler and blessed the Holocaust and requests is grateful for the support of USA for Syrian Al-qaeda and Muslim Brotherhood rebel’s. And said USA must perform military intervention in Syria and in Egypt for the sake of Allah, added El Qaradawi! Mr. Miles you are again supporting a terrorist. Hamad Bin Khalifa The Second. Hamad Bin Khalifa is a Muslim Brotherhood Ally. Qatar played a big role in making sure the Brotherhood will rule Egypt forever by the Qatarian support and finances. Qatar asked the USA and the Nato to invade Arab Countries like Libya, Syria and now Egypt. The following Video, Obama in his own words is saying:”Qatar is a great country that is working on huge reforms and spreading the Democracy in the Middle East, but Hamad the Prince of Qatar, he is not a reforms nor a democratic guy at all; Hamad is a dictator!!! The video is in English from the mouth of Obama Bin Lyin!!! Why USA is supporting a Dictator? Because USA sponsor and support Terrorists and Dictators. So simple. So do you Mr. miles. 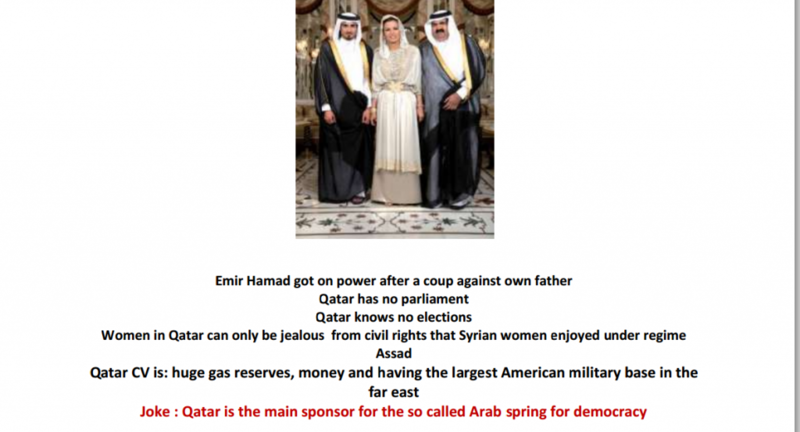 A Sad Joke : Qatar is the main sponsor for the so called Arab spring for democracy! 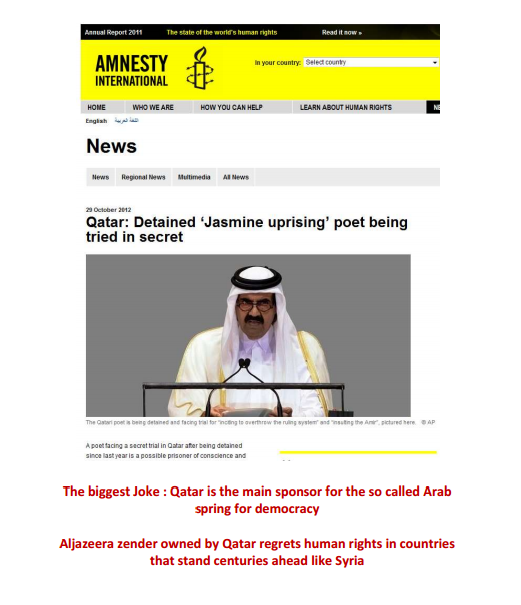 And Prince Hamad who support freedom of speech and all the revolutions in the Arab countries and the Arab Spring, has locked in jail for life, a poet who dared to write a poem about the Arab Spring, praising the revolution against tyranny. The poet has never given any signal to the Prince of Qatar in his poem, he just mentioned those Arab Leaders who were dictators in the Arab countries and with no names. 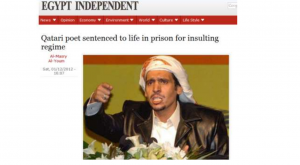 Qatari Poet sentenced for life in prison for criticizing the Qatari regime in one of his poems!!! For insulting the Regime in one of his poems!!! He was also accused of planning a coup through his poem!!! Al-Jazeera Channel owned by Qatari State, they attack and call for revolutions against the Arab countries leaders who are on the Chaos creative project on the USA Agenda. Al-Jazeera known of spreading fabricated news and lies about the real situations in countries like: Tunis, Egypt, Libya, and Syria. While, they totally ignore any massacres or killings or oppression in the countries ruled by the dictators they support. Mr. Hugh Miles, I searched and dug hard to find just one poor word of honesty in your article, I didn’t find any, except your own Name! Shame Shame On You, Hugh Miles, you are a disgrace on the foreign Media. And if you are living in Egypt as I learned, I think this is why the pollution in the Environment here was recently increasing. Since you are doing too much of poisons exhalation on the Egyptian Territory! Hey, Mr. Hugh Miles, come a little bit closer to take a picture with other fans of Al-Jazeera!